Midnight phone call from doctor meant an immediate evacuation of Tree Hugger ABC, a long drive to see Mom in hospital, and a night without sleep. She is improving. 'Bent and I got a short nap around noon. I've had no blank days on AP in 2019 so I had to do foothab basics before collapsing into bed for a real sleep. Gym workout at Tree Hugger ABC. Warmed up with 2 km of rowing. The last 24 hours had a few “highlights”: a nasty drive in the dark in snow-rain, a night in a mediocre motel, learning at 6 am that Mom didn’t need me there to give her a ride after all, moving her computer a few inches and somehow causing the power switch to stop working, finding a tech repair shop and taking it there - phew. It was great to get back home - until I found three puddles of stinky dog vomit. On our duvet. But the day finished off fun when ‘Bent and I went to a live show by Youtuber Randy Rainbow. Warning: might offend people who don't like certain body parts mentioned in a song and will definitely offend Trump supporters. Another ice run in Kahtoolas, this time at Glen Haffy with Erin Heuts (Squirt when she was on AP). Lots of very icy hills where we had to move cautiously, even in spikes. We'd never run together before but now that Grandma is watching Grace occasionally, we're going to try to get out once in awhile. Erin is faster but my "slightly too fast" pace is her "comfortable" pace so while she's getting back into shape, we should be OK together. It was another beautiful, sunny day and it was great to have someone to chat with! Kahtoola run around the glaciers of Palgrave East and West. My cold is fading nicely so we'll see if this kicks it back into gear. Hopefully not - I felt pretty good out there. It was my first run with a heart rate monitor in a long, long time. In our early days of AR, I got into HR training for a couple of years but I was able to estimate my HR pretty accurately after awhile so it didn't seem worth measuring it anymore. I'm only guessing at my current max heart rate but based on when I started to go anaerobic, I think my estimate is pretty close (HRmax around 165-ish). Today wasn't a good day to push the limits. 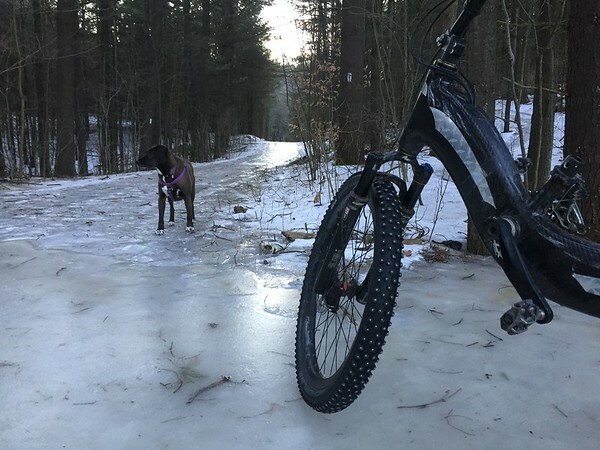 This is 'Bent's photo from his commute today on the same trails.